Parts of Barnsley that lie to the east and north of the town centre were in the Hemsworth Parliamentary Division until 1974. 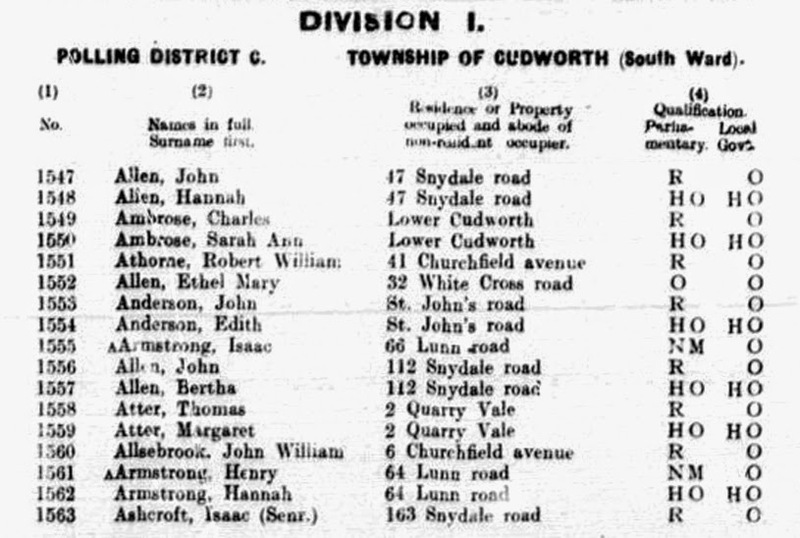 This included Cudworth and in order to research the the history of their area the Cudworth Local History and Heritage Group purchased the microfiche of the Registers of Electors for the period 1918 to 1974. With their kind permission we have extracted the names of the 1918 Absent Voters from the Polling Districts that were within the Hemsworth PD, which now fall in the Barnsley MBC area. Unfortunately these registers are not in the format we enjoy for Barnsley town centre (see this page) and nearby villages. Men (and women) who were expected to be away from home for the 1918 election are indicated by a small 'a' before their names and by the letters 'NM' in the qualification column. There are no details of their service, but at least we have the names and addresses. Remember that the list will have been compiled in late 1917 and early 1918 and as the war still had some months to go men named on these lists may have subsequently been killed, discharged home wounded or taken prisoner of war. The following links lead to downloadable .pdf documents listing the extracted names and addresses. Note that the men are listed in the order they appear in the Register, alphabetically by Division within each Ward or Polling District. These pages have been transcribed by our volunteers Pete Schofield, Phil Gregg and BarnsleyHistorian and all mistakes are our own. Please let us know if you spot anything glaringly wrong and we will make ever effort to correct it. Note, however, that some roads and streets may have been spelt differently in 1918 or at least spelt differently in this source to the way you are accustomed to seeing them! For example: in Cudworth Somerset Street (now) is spelt Sumersett Street.